WARNING: To guard against electrical shock, always unplug your computer from the electrical outlet before removing the cover. CAUTION: When replacing the processor, do not touch the underside of the new processor. CAUTION: When replacing the processor, do not touch any of the pins inside the socket or allow any objects to fall on the pins in the socket. 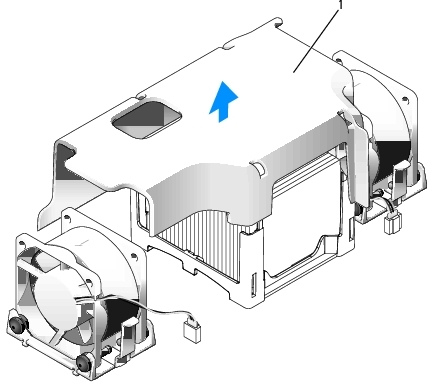 Remove the fan shroud by lifting the fan shroud up and away from the computer. WARNING: The heat sink can get extremely hot. Ensure that the heat sink has had sufficient time to cool before you touch it. 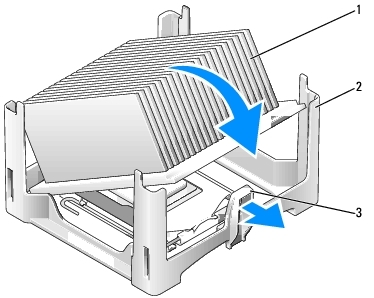 Pull the release lever on the retention base away from the heat sink until the heat sink is released. Gently lift the heat sink from the processor. Lay the heat sink down on its top, with the thermal grease facing upward. CAUTION: Unless a new heat sink is required for the new processor, reuse the original heat sink assembly when you replace the processor. Open the processor cover by sliding the release lever from under the center cover latch on the socket. Then pull the lever back to release the processor. CAUTION: Ground yourself by touching an unpainted metal surface on the back of the computer. Gently remove the processor from the socket. 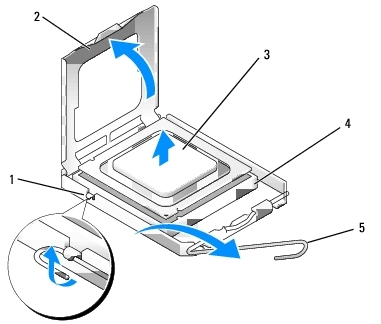 Leave the release lever extended in the release position so that the socket is ready for the new processor. Unpack the new processor, being careful not to touch the underside of the processor. If the release lever on the socket is not fully extended, move it to that position. Orient the front and rear alignment-notches on the processor with the front and rear alignment-notches on the socket. Align the pin-1 corners of the processor and socket. CAUTION: To avoid damage, ensure that the processor aligns properly with the socket, and do not use excessive force when you install the processor. Set the processor lightly in the socket and ensure that the processor is positioned correctly. When the processor is fully seated in the socket, pivot the release lever back toward the socket until it snaps into place to secure the processor. 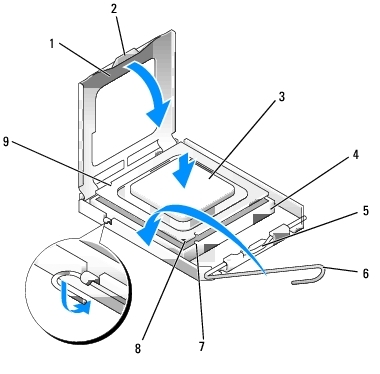 If you are installing a processor replacement kit from Dell, return the processor to Dell in the same package in which your replacement kit was sent. Clean the thermal grease from the bottom of the heat sink. CAUTION: Ensure that you apply new thermal grease. New thermal grease is critical for ensuring adequate thermal bonding, which is a requirement for optimal processor operation. Apply the new thermal grease to the top of the processor. Place one end of the heat sink under the tab on the retention base on the side opposite the release lever. 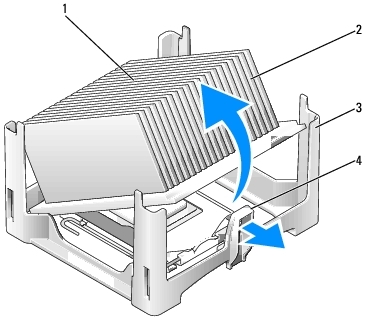 Lower the heat sink onto the processor at a 45-degree angle so that one end of the heat sink fits securely under the tab opposite the release tab on the retention base. Replace the cable cover, if used (see Attaching the Cable Cover).